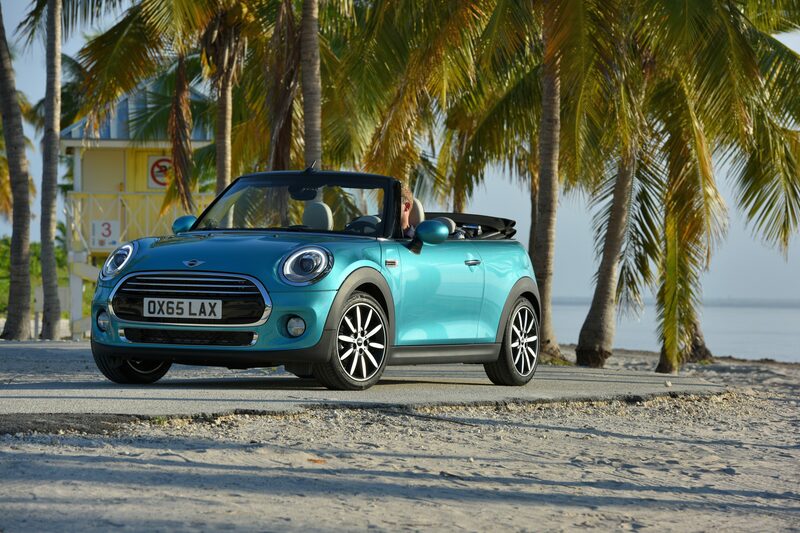 This is the stylish new Mini Convertible which goes on sale from next March with prices starting at £18,475. 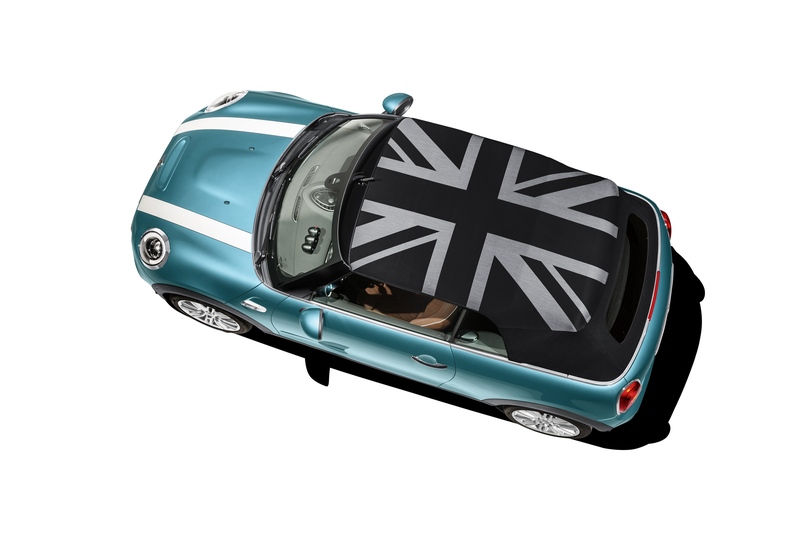 However, the real attraction for many will be an industry first with drivers able to order an impressive personalisation option of a Union Jack that is woven into the fabric roof. There are three cars available at launch: the Mini Cooper Convertible which is also available in the ‘D’ and ‘S’ guises. The new car is a practical and stylish choice with dynamic handling and the new electric roof is more refined and quieter than the model it replaces. The roof can be retracted in just 18 seconds. Mini have also increased the size of the boot by 25% to help accommodate the roof and the rear seat passengers also have more space. The Mini Convertible also comes with lots of equipment as standard including Bluetooth connectivity, rear reversing camera and rear parking distance control. There’s also the firm’s ‘Connected’ system and ‘Visual Boost Radio’. 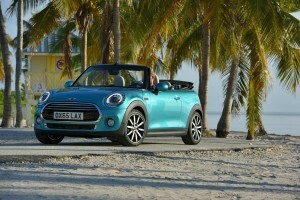 The all-new Convertible is part of the Mini reinvention and will build on 12 years of success for the little marvel. Mini says its car is the only premium four seater soft top for the small car segment and the biggest market for the Mini Convertible is the UK. Drivers will get to enjoy a freshly designed interior, some striking exterior styling and an integrated rollover protection system. The new Mini Convertible is slightly longer and wider than the model it replaces which enables more space for occupants. Some drivers worry about using a convertible all year round but the new Mini has been insulated to optimise its heat saving abilities and it’s also has more acoustic protection. The roof itself can be opened and closed when travelling at speeds of up to 18 mph and can also be remotely activated when the car is stationary. The Mini Convertible is still a nippy and agile performer with the 1.5 litre engine having a top speed of 129 mph and producing 136 HP. It will go from 0 to 62 mph in 8.8 seconds and should return around 55 mpg. For those who like a more thrilling ride, the Mini Cooper S Convertible has a 2.0 litre engine that produces 192 HP and has a top speed of 143 mph. The sprightly engine will travel from 0 to 62 mph in 7.2 seconds and should return 46mpg. Even the automatic gearbox version will reach 62 mph in a fraction of a second less. Expect to see lots of the Mini Convertible models on our roads from next year, with the eye-catching Union Jack with design being particularly popular. This entry was posted in Car Leasing, Cars, New Cars, Small Car and tagged Mini Convertible by Steve Lumley. Bookmark the permalink.